Anyway, it's supposed to be [Alucard] taking a walk out during the dead of night (aka Midnight) on a night where the moon is hidden behind thick clouds. The cemetary, where he's at, is shrouded in dense forest and a little bit of mist. The castle is up on a hill and is illuminated by what moonlight and starlight there is. And that's how it goes. 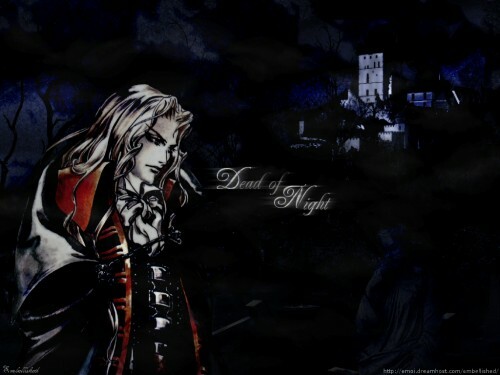 The picture of [Alucard] is a png form aethereality.net. All the stock photos are from stock.xchng . Thank you for looking (and reading). I hope you enjoy. I love the background, but like you said i think its too dark..